Starring George Sanders, Hurd Hatfield, Angela Lansbury, Donna Reed. An important tip: if you're ever a contestant on Jeopardy, remember that the response, "What is "The Portrait of Dorian Gray? ", will get you a loud, money-losing buzz. Everybody makes that mistake; it's the most popular trick question in the book. A public service of DVD Savant. At age twelve, two images in my Famous Monsters magazines unnerved me. As we re-read our magazines and comic books countless times, I bookmarked the photos so I could avoid them. One was the horror-face of Guy Rolfe in Mr. Sardonicus, which seemed to be laughing right at me, personally. The other was a B&W image of a painting of a man formally posed, but rotting as if he were a corpse. The reaction to this one was different. Was everything else I read wrong, and this is what happens to people when they do bad things? As it turns out, one of the creepiest Hollywood movie images of the war years came from the studio of glamour and prestige. MGM didn't make very many horror films, but two of its 1940s pictures were prestige "A" efforts. Stuffy good taste and heavy-handed moralizing pretty much neuters 1941's Dr. Jekyll and Mr. Hyde. 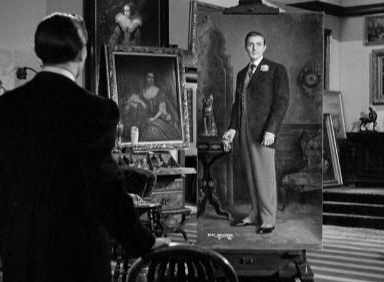 Made four years later, Albert Lewin's The Picture of Dorian Gray is a high-toned adaptation of Oscar Wilde's strange tale of a man whose vices are reflected not in his face, but in a haunted portrait. Straight from his acclaimed, highly intelligent The Moon and Sixpence, writer-director Lewin infuses Dorian Gray with murky undercurrents of forbidden vices. Depending on one's taste, the picture is a fine example of cinematic discretion in the Val Lewton style, or a cultured pretzel that must twist and turn to avoid its own subject matter. The Picture of Dorian Gray was a big success for Albert Lewin and MGM. Oscar Wilde's famous horror premise begins with the meeting of the cynical Lord Henry Wotton (George Sanders) and the beautiful, innocent Dorian Gray (Hurd Hatfield) on the day that Gray's portrait is completed. Both men are rich and idle, with little to do but cultivate their own amusements. Wotton poisons Gray's mind with the notion that the only way to truly live is to seize all sensation within reach, with no regard for others. To Gray's horror, a wish he makes comes true: he will be untouched by time while his portrait ages in his stead. Hidden in the attic, the painting reflects all of Gray's moral crimes. As his contemporaries grow old, Dorian Gray remains as beautiful as he ever was. As delivered by the velvet lizard George Sanders, Lord Wotton's droll observations are both hateful and witty: "There's only one way to get rid of temptation, and that's to yield to it." "Forgive me for the intelligence of my argument; I'd forgotten that you were a Member of Parliament." In Lewin's symbol-ridden vision, Wotton is seen chloroforming a butterfly, which dissolves to the "preserved" visage of Dorian Gray. The handsome Hurd Hatfield is directed to be not the smiling young man of the story, but a rather sinister figure. Gray's mask-like face seems to lack the spark of life. His smooth features remind us of the partially finished pod people in Invasion of the Body Snatchers. What Donna Reed's underwritten Gladys Hallward sees in Dorian is unclear. The only interpretation that absolves Dorian of blame is that Lord Wotton is The Devil. As pointed out by Steve Haberman in his commentary, Wotton is really just a Devil's Advocate. To depict Dorian Gray's history of vice and wrongdoing yet satisfy the Production Code, Lewin trots out every manner of narrative evasion and ellipsis. 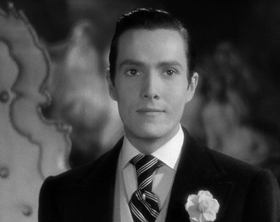 Most of Dorian Gray's crimes are merely referenced through hints and gossip in Cedric Hardwicke's voiceover. The images show next to nothing, forcing us to fill in Gray's moral crimes with our own sordid imaginations. What if he's just a victim of malicious gossip? A female party guest hides her face when Dorian enters, indicating some unspoken shame at his hands. Gray is seen ascending the back stairs in a barroom; the presence of dwarf Angelo Rossitto suggests even more perverse activity upstairs. Beyond his one stabbing murder, the rest of Dorian's on-screen criminal behavior is limited to drinking in grog shops and walking in the fog. Is this civilized horror, or a radio show? Frankly, Gray doesn't look like he's enjoying himself enough to persist in whatever morally repugnant activities he has going. He's as lifeless as a Marcel Proust character, without the productive self-analysis. Other content is not as vague. For its year the film is rather daring in suggesting homosexual vibes in the Wotton/Gray relationship. Lord Wotton dotes on Gray as if conducting a social experiment. Later in the story, Dorian blackmails a man who has become a miserable wreck because of their previous association, and we're told that another male friend has killed himself over similar pangs of guilt. It's difficult to picture anything but homosexual relations as the unspoken subject. That Dorian is never shown having a good time with his vices is a choice more likely than not mandated by The Code. The dead-eyed Hurd Hatfield moves joylessly through polished MGM hallways; London's wealthy are seen only in fancy gowns and formal dinner attire, like figures in a waxworks. Like Wilde's pickled butterfly, The Picture of Dorian Gray lacks life. The Technicolor inserts of the gory portrait caused a buzz among audiences; its surface seems to be painted with bloody entrails. The portrait records all of the horror that the rest of the movie scrupulously avoids. After all the polite restraint, The Picture of Dorian Gray doesn't leave much room for moral ambiguity. Albert Lewin's search for high art is ultimately compromised by the censor edict that all immoral behavior be countered with an endorsement of religious values. At the fade-out, Lord Wotton does a complete character flip-flop, asking for heaven's mercy. The last image is of a poetry verse, in a book displayed like a fancy Bible. 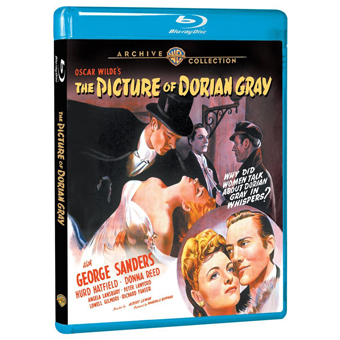 The Warner Archive Collection Blu-ray of The Picture of Dorian Gray is nearly picture perfect. Lewin has tight control of the visuals and includes many moody scenes of the top-hatted Gray wandering on docks and frequenting greasy dives 'below his station'. The interiors of the rich, however, have the flat MGM studio formula lighting that makes contemporary dramas, comedies and period films all look the same. The show won an Oscar for Best Cinematography. The movie seems to be planned around actors with cultured, distinctive voices. 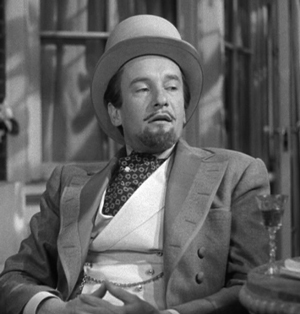 George Sanders always speaks as if hidden insults were behind his words. Hurd Hatfield sounds curious but drained of energy; he's such a limp Louis that we're happy that Donna Reed married George Bailey instead. (Boy, but Reed doesn't belong in this picture.) Sir Cedric Hardwicke's narration tries to be morally neutral, yet summons up dark clouds of guilt and shame. 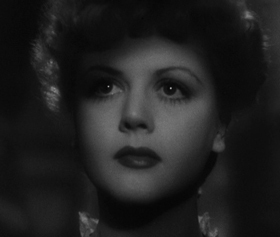 Amid all the gloom Angela Lansbury's delicate voice is indeed like a little innocent bird. Credit Lewin for putting together an 'artsy' film that's reasonably faithful to its source, if one ignores the last few seconds. Readers are going to be curious about the film's Technicolor inserts of the paintings, the 'after' version of which was created by Ivan Albright, a specialist in morbid subject matter. Now part of the collection of the Art Institute of Chicago, it's a fully realized work of art. In 35mm prints the color inserts were physically spliced into prints, producing a splice jump. Here in this Blu-ray the portrait shots almost jump out at us. The reveal of the rotted-face image is accompanied by a blast of music. The reds look particularly gory. It's a powerful gimmick, and more successful than many of its kind. Lewin apparently liked this trick. His B&W movies The Private Affairs of Bel-Ami and The Moon and Sixpence also had sequences in which an artist's work jumps to full Technicolor. The only problem is that we feel let down when the image returns to B&W again, especially the portrait. He solved the problem in Pandora and the Flying Dutchman by simply making the whole movie in Technicolor. Had Lewin a real sense of humor, he would have left one or two shots in B&W. The extras come straight from Warners' old DVD release. They include a trailer and two Oscar winning shorts, Stairway to Light and the Tom & Jerry cartoon Quiet Please! But fans will want to give a listen to the commentary with Angela Lansbury, hosted by Steve Haberman. 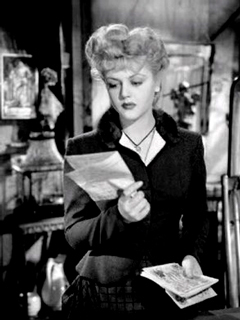 Haberman compares the film to the novelette -- there are many interesting differences -- while Ms. Lansbury shares detailed recollections about most everyone associated with the production, including director Lewin. She voices sympathy for Hurd Hatfield, who she says was directed to keep his face still and mask-like in all scenes. Lewin gave Hatfield inflexible line readings, locking him into the rigid performance we see on the screen. 1. Interestingly, writer Vladimir Nabokov seems to have borrowed the name Sybil Vane for his haunting -- or haunted -- 1951 short story The Vane Sisters. There's no explicit connection, but one tale always reminds me of the other -- hidden shame and sadness. 2. The 'magical' situation in the movie Groundhog Day is really the inverse of the same concept. Trapped in a state in which he will never age, Bill Murray tires of his selfish pranks and improves himself instead. Murray doesn't need a portrait, as he transforms into a better person we can see.